Although the Portuguese first reached the Cape of Good Hope in 1488, the first serious traders were the Dutch, or as they came to be known, the Boers, or Afrikaners. Boer means farmer, the occupation of most of the settlers. The Fort de Goede Hope was built in 1652 when merchant Jan Van Riebeeck created the first settlement. The intention of the company was that the settlers would grow enough food to supply passing ships, so they hoped to barter with the natives and avoid fighting with them. However, because the Khoikhoi did not want to sell enough cattle for the settlement to meet its needs, there began to be conflicts. As the whites moved inland to find the best farmlands they seriously encroached on Khoikhoi land. The Dutch stole as well as bought cattle from the Khoikhoi. As they moved inland, conflicts grew worse. 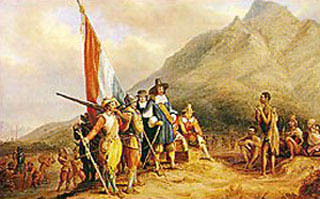 In 1659, the Khoikhoi fought the Dutch over grazing land south of Able Bay. After losing to the Dutch, the Khoikhoi went into a great decline and their civilization virtually disappeared. Many of the Dutch became traveling farmers (trekboers), not unlike the Khoikhoi, herding their cattle and sheep and on the move to better grazing land.